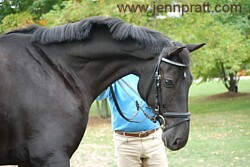 Thinking about the next Commission | Jennifer Pratt Equine Artist. In the studio, I’m just finishing up a coloured pencil commission of a jumper. Sorry friends I can’t post it until it has been delivered..it’s a surprize for the owner 🙂 But I can say, he is looking fabulous! I am starting to get very excited about my next commission. He’s a gorgeous Westphalian gelding by Pik Labionics. 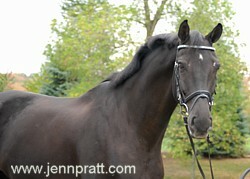 He was imported to Canada two years ago as a dressage prospect. 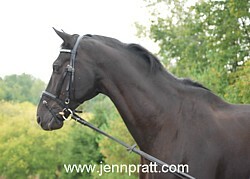 Tall and black, he has a remarkable uphill build, which certainly shows he as bred and born to be a dressage horse. Po is currently living at Grand View Farm in Newmarket, Ontario. We have yet to decide on a compostion, but above are a few of my favorites. One feature of this that stands out to me is the shape of his eyes..Almond eyes..they will be important to capture in the final commissioned piece.